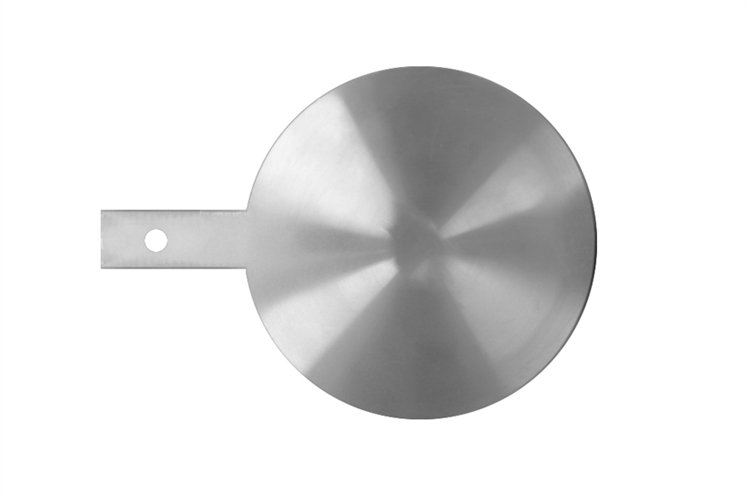 Benchmark Site Services specializes in custom fabricated and stock flanges, Blinds, Paddle Blinds, Vented Paddle Blinds, EZ Vent Blinds, Ring Spacers, Spectacle Blinds, Bleed Rings, Blind Flanges and more. We manufacture and machine our blinds in Canada and ship worldwide. Our prices are among the most competitive in the world. Since our materials are made and modified in Canada they are certified quality. Single Blinds or Blanks are positive shut-off devices that prevent flow through a pipeline. Ring spacers or Open Blinds are used to fill the space of Single Blinds when they are removed from the piping system. 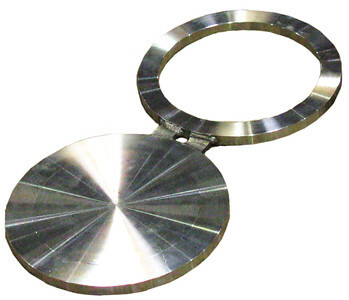 With space, weight, and other pipeline requirements permitting, it may be more convenient and cost-effective in specific situations to use a Spectacle Flange, which is a combination of the two that can be rotated to function as Single Blind or a Ring Spacer. Spectacle Blinds are generally applied to permanently separating pipe systems, or just to connect with each other. A Spectacle Blind is a steel plate cut into two discs of a certain thickness. The two discs are attached to each other by section of steel similar to the nose piece of a pair of glasses. One of the discs is a solid plate, and the other is a ring, whose inside diameter is equal to that of a flange. Spectacle Blinds be applied in systems, which regularly need to be separated from other installations. Normally, a Spectacle Blind is mounted in the “open” position so that flow through the pipe is possible. If the Spectacle Blind in the “close” position is rotated, the pipe is blanked off and no flow is possible. Maintenance on a pipe system can be a reason to rotate the spectacle in the “close” position. This run will take place through the hole, that is drilled in the connection piece. By loosening of all bolts, and partial removal of their, the Spectacle Blind can be rotated. After replacing the gaskets (new gaskets are to recommend), the bolts can be re-assembled and tightened. Spades and Ring Spacers are basically the same as Spectacle Blinds, except that both are not attached to each other. 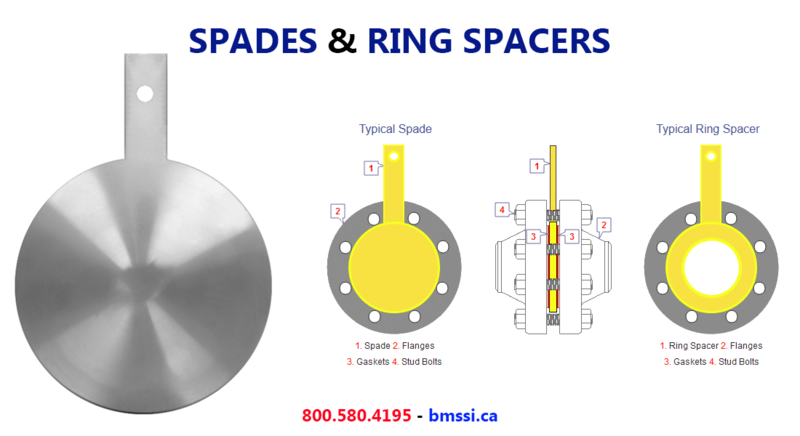 Spades and Spacers be applied in systems where maintenance is often not necessary, or in applications with large pipe sizes. Depending on the flange size and the Pressure Class, Spades can weigh hundreds of pounds. To prevent unnecessary weight to a flange connections, usually will be chosen not for a Spectacle Blind, but for 2 separate parts. So as for the Spectacle Blind already described, maintenance on a pipe system can be a reason to temporarily replace a Ring Spacer for a Spade. By loosening of all bolts, and half of the bolts temporarily remove, the Spade or Spacer can be placed. After replacing the gaskets (new gaskets are to recommend), the bolts can be re-assembled and tightened. A small problem is that we basically can not see, or a Spade or a Spacer mounted between the flanges. Therefore the handles are often specially marked, or both have a different design; a customer often provides its own specifications as needed. What should never lack is, that in the handle, the diameter and the Pressure Class of a Spade or Spacer is engraved; this applies also for the Spectacle Blind. The sealing surfaces of a Spectacle Blind, Spade or Ring Spacer are usually conducted in accordance with the Face Finish from the flange. The diameter always is slightly larger than the Raised Face of a flange; by a correct assembly, the bolts are just not touched by the Blind or Spacer. The diameter of them, is depending on the flange size, and the thickness from the Pressure Class of a flange. ASME B16.48 covers pressure-temperature ratings, materials, dimensions, dimensional tolerances, marking, and testing for operating line blanks in sizes NPS 1/2 – NPS 24 for installation between ASME B16.5 flanges in the 150, 300, 600, 900, 1500, and 2500 Pressure Classes. Spectacle Blinds, Spades and Ring Spacers should be made from a plate or forging specification, approved for use by ASME B31.3, of essentially the same chemical composition as the mating flanges and piping involved.